Why to use cuttings instead of seeds? Cloning the Cannabis sativa plants means asexually reproducing identical copies of your cannabis mother plant. During the vegetative, long day growth (18h) you might notice that some of the plants grow faster than the others. Those that have well developed, dark green leaves, a strong stem and no signs of plant diseases could be candidates for mother plants. If the lowest leaves are turning yellow it’s just a question of nitrogen deficiency and no need to worry about, just adjust your fertilizing. You would then grow it separately, keeping it in a constant vegetative state (18 hours of light). It is possible to take more cuttings from this plant to make several mother plants, depending on the size of your installation. When growing cannabis plants from seeds you will get a certain amount of genetic variation of the plant material. With seed reproduction the plant size can vary greatly (depending on the variety) during the vegetative growth stage and this then also affects the size and the quality of the flower yield. Furthermore, the growth time from seed to harvest can be reduced by taking cuttings from a well-established mother plant. The cutting is morphologically and age-wise an identical copy of the mother plant. This is a good argument because depending on the variety of the cannabis plant, the full production cycle from seed to dried cannabis product can last as long as 6-8 months. Producing clones (cuttings) of your cannabis plants is relatively easy and it saves you time and you can also predict your yield more accurately. When you are using dioecious Cannabis sativa variety you need to identify the female plants from male plants. The most reliable way to do this is to take cuttings from your plants and put them to root (2 weeks) and then induce flowering (2 weeks) at short day conditions (12 hour photoperiod). The male plants will start to produce flower buds first and the female plants will shortly follow. The identification is simple: female flower bud has two stigmas and the male plant does not (See pictures below). Note that when the plants have been switched to generative stage it is not possible to turn them back to vegetative stage, otherwise irregular growth will occur. Hemp variety ‘Carmagnola’. Left female plant and right male plant. Pictures taken 31 days after cutting. Hemp variety ‘Carmagnola’. Left female plant and right male plant. 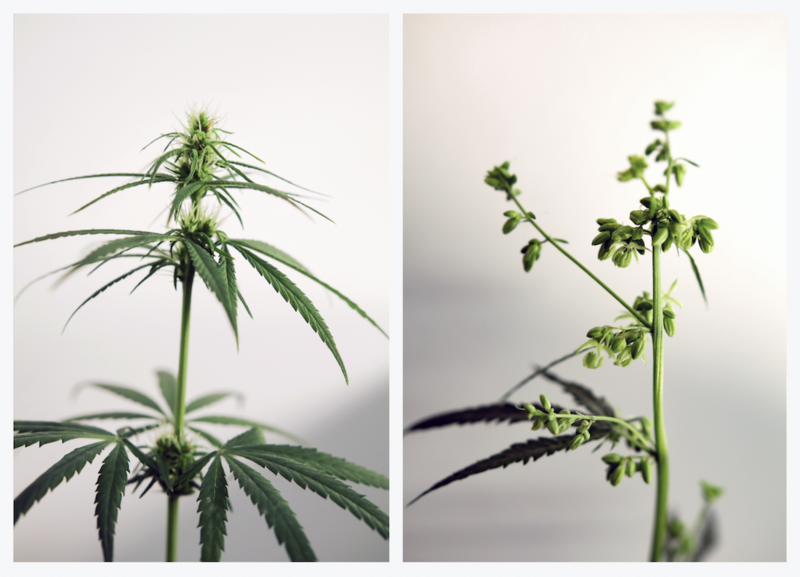 Pictures taken 37 days after cutting, when male flower flowers have already started releasing the pollen. Note that in the beginning you get only one cutting per plant, the top growth tip. From the second topping you get 4-6 cuttings, so it is good to have the right amount of mother plants that you use to get enough cuttings. Then again, when you have established your mother plants you can use the same plants six months. It is good to stop fertilizing your mother plants approximately a week before taking the cuttings to reduce the amount nitrogen in the plant. If there is a lot of nitrogen in the cutting you take, it will use its energy to grow more leaves and not root. This can be prevented by irrigating the plants with only pure water or using commercial leachates. Prepare to have the needed tools in hand when you start cutting. The best tool for cutting is a sharp knife. If you prefer using shears make sure that they do not crush the stem and you can get a clean cut by using them. Also remember to sterilize your tools before use. A substrate to place your cuttings in will be needed. There are several commercial products for this. A good substrate has a good water holding capacity, but not so good that the cutting starts to rot. Peat is considered to be a bad option for this and especially the fine kind because it stays very wet. Rockwool is a good option but remember that its pH is alkaline (pH > 7.0) and you have to adjust the pH to have it in the optimal range for rooting (pH 5.5-6.5). 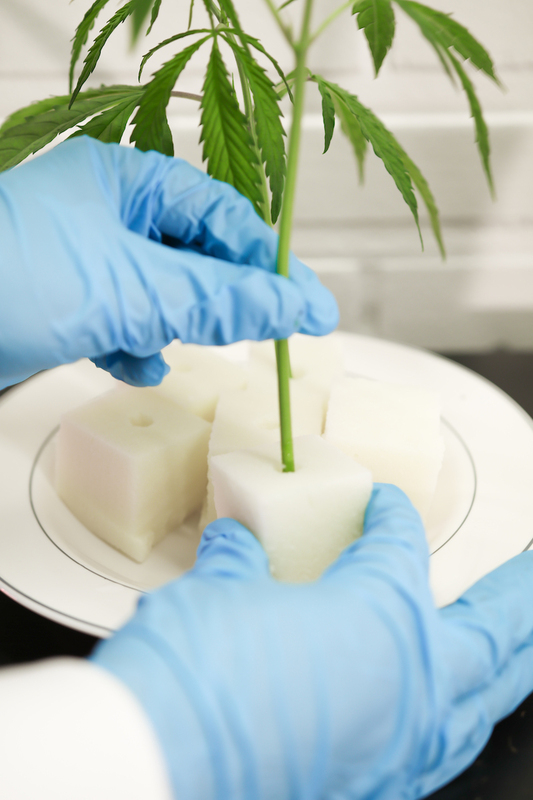 In the pictures below, sublime (polyurethane) cube is used as the growing medium for cuttings. It is also good to have an auxin-based rooting gel that helps the cuttings root faster. The gel also protects the cut surface from drying out and from getting contaminated. Left picture: Take the cutting 1 cm above the node having the knife at a 45° angle. Right picture: Dip the cut surface area in to rooting gel to ensure that no air gets in to the stem and that it also stays free from fungal diseases. Left picture: Place the cutting into the substrate with a readymade cross cut in it so that the cutting stays securely upright. Center and Right picture: Cut extra leaves off. When the photosynthetically active leaf surface area is reduced the evaporation also reduces and the cuttings won’t lose that much water. Cannabis sativa plants need a rooting environment with a high relative humidity (> 90 %), warm temperature (24-25 °C) and 18 – 24 hour photoperiod. At this point it is important to moderate the light intensity because high light encourages the plant to continue vegetative growth. Lower than 100 µmolm-2s-1 light intensity promotes rooting and prevents light stress symptoms. Remember that the most important thing for the rooting is keeping up the high humidity. You can ensure this by misting the leaves with water twice a day and watering the growing medium every other day. After the cuttings have rooted an acclimatization period is needed to adjust the plants for high light and lower humidity conditions. First steadily lower the humidity from 95 % to 70 % during a five-day period, and on the sixth day increase the light intensity to 300-400 µmolm-2s-1. If the plants start to hang their heads during acclimatization, increase the humidity a bit after the plants have recovered and started standing straight try again.